I will share this for as long as I live and as long as someone will listen. It changed my life, and continues to this day. Many years ago, maybe 10 or more, I was accustomed to meditation and prayer every night, I was not religious by any means and I did not attend every church service. Much of my relationship with God developed outside of the traditional church service. There are many more things I could share with you that would help bring you to the point of this experience, but to save time, I will just start here. Every evening and for many years now, I look forward more than anything, to that time of prayer. To a time when I felt I was connecting and communicating directly with God. Many of my prayers were much like any one else, asking for the things I felt I needed in my life, and that of family and friends, coworkers, the world. But I began to realize a deeper need that wasn’t so evident. For years, as many do, I spent my time asking for things or situations from someone I didn’t even know. He was my security blanket, or band-aid. I imagined if this God loved me as much as I have been taught to believe He did, then didn’t he also long and even ache for me to know Him and not just what He could do for me? I experienced this later in life with my biological father, always there to provide money, and buy me things, but I never knew him. So….I made an effort to listen…to become attuned to that “voice” within. My mom explained it to me when I was kid….and I will never forget it. “Mom, how do you know when you hear God’s voice?” Her honest reply was “its that little voice in your head that tells you not to do something that you shouldn’t”. Simple answer and sufficient for probably a 7 year old at the time. I later realized she was really speaking about consciousness. And that was the God conscious I would hear when I was about to do something wrong, or some would call the “mind of Christ”…..unlike my own. I don’t remember falling asleep, I don’t remember a specific moment when things changed, but at some point just being caught in this feeling of His presence, I found myself in another world, another place. A place where time didn’t exist, where there was nothing physical to be seen or experienced. The only way I can describe it visually, was space without stars, dark, but full of light. Because before me and all around me were beings of light. I suppose you can call them angels, but that is a very elementary description of what I was seeing. Some people would say I had an out of body experience, more progressive Christians would say I was having an open vision. All I know is that it was the most real experience I have ever had to this day. I didn’t have a body and couldn’t see myself. It was as if my mind or my conscious was existing somewhere else. I remember feeling like I was being held up or supported by two of these angels, but I couldn’t see them. There was a tremendous beautiful white light in the center of my view. It was pure, I don’t know how I knew this but I just knew it. And I realized that this was God. I didn’t see a man in a long flowing robe, or with long hair or a beard, just pure white glorious light. All around Him were billions even trillions of angels that extended for what seemed like millions and millions of miles. I felt so far away but I felt so close at the same time. It was as if time and distance didn’t exist. Hard to explain or convey with the words I have in my vocabulary. I could write a book on this one experience and all the things I have learned since because of it. The angels all were light, there were no features that were recognizable, or distinguishable, I could not see a difference between male and female, black or white, American or European…..there were no differences. They all had somewhat of a bluish indigo color in the center and other colors, smoky even…but brilliant. I was absolutely fascinated and overwhelmed….by what I was seeing. Then I became aware of what I was feeling. I can’t even begin to describe what I was feeling, but only what I know because of it. I was completely and totally saturated with love. Every molecule of my being or body or whatever you want to call it there, was permeated. His love is so powerful it literally touches every single molecule, atom, electron……I realized in that moment, here on earth in this life, we are poorly equipped for the expression of this great love. Here, we get glimpses of love, through the nice things we do, the things we say, the tears we shed….we can only attempt to express this through our acts and words. But in Heaven (if this is where I was)…..Love is not expressed it simply JUST IS!!!! I remembered scriptures that describe God as being Love, God IS love. His love is so pure its as if it’s tangible, like you touch and really truly see it. This feeling that everything about me was permeated, is the same feeling I get now when I say I feel His presence. Its like every molecule just lights up, and you have this electrical feeling radiating over your body. Its like everything inside you starts to vibrate. I would imagine its like the behavior of two tuning forks. If you strike one and another is within “range” the other one starts to vibrate and resonate with the other on its own. I felt totally connected with Him, like being submerged in warm water, but not only do you feel its effects on the outside on your skin, but also within. I guess you could say I felt like what a sponge would feel like if submerged and completely saturated. Here in this life, love is so often mistaken for many other things and many other things are mistaken for love. We do things in an attempt to express it, but fail many times. There is no greater love than that of God, even a mother’s love for her child pales in comparison…and the reason this is so, is because we are limited in our ability to express it, to show others what it is. I think of a person born with no sight or hearing. I would imagine the only expression of love he or she could comprehend would be through touch…and one day if he/she was able to hear and see, and someone said “I love you” even with tears running down their face, he/she would still not be able to comprehend what was being communicated. Often times our frames of reference of what we perceive is love, is distorted and corrupt and therefore so is our expression of it. Another remarkable thing is that I was communicating with these angels, but not with words, spoken, we didn’t even have vocal cords, that’s flesh, and nothing of flesh could withstand His glory. I understood it, remembering again, that if you saw the face of God you’d die, not being able to withstand it. There was so much warmth there. In Heaven everything is visible. Here we communicate with body language, with the spoken language, with writing, with music. But in Heaven everything is before you, there is no need to question, no need to discern or figure out something. No language barriers. You get tremendous amounts of revelation knowledge by seeing. Imagine if you were blind and someone was describing a bird to you…. Having never seen one, you’d probably have some crazy image in your mind about what a bird looked like…. But if you could actually see it, immediately you’d know, no description needed. I now understand the importance and advice of the scriptures to “not look upon sin” because you literally take it into your being. Our eyes are truly the windows to our souls. Likewise with our ears. What we choose to listen to, ends up residing in our spirits. Like computer programming, what goes in comes out, even if it’s a defect J and sometimes it shows up in the most unusual or unexpected places and may not show up for months or even years. In Heaven you truly are transparent, because you are a reflection of Him. I remember formulating the question in my mind why all the angels were the color they were. I received my immediate answer then and continue to receive it to this day. The angels were literally a reflection of the pure white light. This is how God taught me about the light spectrum and how you could split pure white light up with a prism to see all the colors of the rainbow. Days later I asked for more information more answers to what I experienced and God caused me to think about a prism, and taught me a simple principle. God has many many characteristics, and it is our purpose and should be our goal to line up just so with him, to reflect all the many colors/characteristics of Himself. Because when you line up a prism just right with a ray of white light, all the colors become visible(well most, indigo isn’t visible to the naked eye) The true nature of the light is revealed and expressed. It’s the same with God. When we become attuned to Him, lining up with His ways, His true nature is revealed through us. One other aspect of this experience, was much more powerful than what I was seeing or feeling….it was what I was hearing. There was such beautiful music. The most beautiful music I have or most likely ever will hear. All these millions of angels were praising Him, in complete adoration and worship, but what was even more amazing was that again this music was not being sung with their mouths…it was simply emanating from their inner most part. In this life, on earth, you would say it was coming from their hearts. I was so humbled so moved, by this. The only way I could describe it so that you might comprehend it, is to ask you to imagine the whole world, all of creation, every living thing, from the biggest mammal to a one cell organism, even the ocean and winds, singing in perfect, absolute perfect harmony. To this day, I wonder what would happen if everyone on earth decided to at the very same moment, sing the same song, or even hum. I can’t imagine what that would do. There are even theories on how the Egyptians moved the tons of stone to build the pyramids…some think it was through the use of their voice. It reminds me of the story ofJericho and how the people marched around the wall…. (causing vibration) and how they praised with song and music, and the wall came tumbling down. I realized so much and had so much revelation that I can’t even begin to touch on here, but one thing was that I knew without any doubt that the music is what kept the angels lifted up. The vibration of this sound was what kept them suspended and circling around Him. They were compelled to worship and praise and it was as if they had no control of this music that emanated from their inner most part. I remember the story of the woman that had an issue of blood in the bible and how she struggled to touch the hem of Jesus’ garment. He spoke about how “virtue” went out of Him. Being in God’s presence like that, you lose control, and this music/praise just comes out of you. I wish I could explain it better. This part of the experience led to me to the study of Cymatics, which proves that vibration does in fact have the ability to cause physical matter to transcend gravity. Although there was nothing physical in this place. What I was hearing I have learned since is what some have called “the music of heaven”. There is a man I haven’t met personally but who is a minister that speaks of this very same thing in a way that confirmed to me so beautifully that he also has experienced this “music of heaven”. Cymatics describes the principle of “order out of chaos” ..when physical matter such as sand is exposed to vibration, the grains of sand seem to jump around in a mad disarray, but as the vibration continues the sand takes on an intricate geometric pattern, (many of which are found throughout nature in the design of our bodies, the veins of a leaf and so on) and may change according to the frequency and amplitude. Order is established. It makes perfect sense. It makes me think of how trial and tribulation can bring repentance, realigning us with our Creator, God. 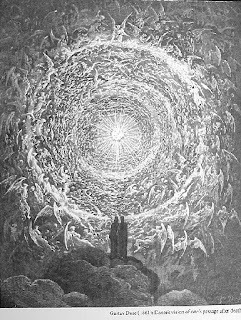 Although I knew it was next to impossible, if the angels were to ever stop praising and just one, even one, had the beginnings of a thought to praise Him and sing, all the other millions and millions would instantly join in. Even thoughts are visible in Heaven. I think about all the evenings I have sat on our back porch growing up and listening to the crickets and frogs, sometimes even the whippoorwills…. if one started to sing, they all did…..like a mighty chorus instantly turned on by the voice of just one. I am amazed even to this day, at the evidence that surrounds us that speak of God, and Heaven. As above so below, on earth as it is in Heaven. I think our experiences are shaped by the limitations that traditional teachings, put on us. I realized after this how extremely important it was for each person to have their own personal relationship with God. We don’t have relationships with our parents through our brothers and sisters, neither should we attempt to have a relationship with God through our pastors, our Christian friends, etc. God teaches us in the way we individually can understand. Certainly we can glean wisdom and understanding through others, but He is the source of truth. At the same time I learned that even though I have been taught indirectly and directly to shun other religious systems of belief, or practices, that there is still truth to be discovered and embraced. The basic fundamental truth I have discovered for my own life, is that no matter where you go, or what you do, when you search for God you will find Him. He exists in the person you work with, the flowers that spring up along the roadside, in the wind that brings the rain and the same wind that destroys. He is revealed in the complex research that is being conducted about DNA, to the vastness of the galaxy we look upon at night. I hear Him in the voices of others, and the sound of a violin as the bow moves across it’s strings. So I am compelled, driven even to discover, to search to continue on this journey that has been and continues to be one of magnificent and awe inspiring adventure. Perhaps this sheds some light on what fuels my fascination and my intrigue. Why maybe I am so passionate about all the things I read and study. I know its been a lot to read, but I hope you were blessed in some way by it. Extremely poignant, Tim, and thought provoking. And very, very moving. What a fascinating read; one I know I'll return to many times. Thank you for sharing this.